Beat The Christmas Bulge With Interval Training! The holiday season is upon us, and it spells trouble on two different fronts: our battle with food, and missing workouts. Let interval training help you beat the Christmas bulge. 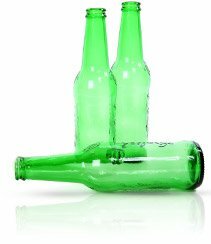 The holiday season is upon us and it spells trouble on two fronts. The obvious is our battle with food. Every time you turn around there's a holiday party, whether it's at a friend's or at the office, and this is going to mean plenty of choice when it comes to very tasty, unhealthy, high-calorie food. Not to mention the free-flowing alcohol you're going to encounter as well. The second front is one that not nearly as many people think about during this time of year, and that's how busy we get and how many workouts get skipped over as a result. We just don't have the time to get to the gym for the usual 1-2 hours per day. Workouts seem to taper off during the holiday season and before you know it, we've eaten all this high-calorie, unhealthy food, beer, and wine, and we're starting to take on a closer resemblance to Santa Claus then we dare admit! In the blink of an eye, the holiday season is over and we're 15 pounds of unsightly fat heavier—not to mention sporting less muscle mass too. It's a downright disaster! For some of us, we struggle to get back into the habit of getting to the gym for our workouts on a consistent basis. Once you've been on the couch for a few weeks, it can be a battle to get back into the training groove, which quite possibly means a permanent vacation from training. So what can you do about surviving the impending holiday doom? The saving grace is interval training! Why Should You Try Interval Training? One study, led by Jason Talanian (Journal Applied Physiology, 102: 1439-1447, 2007), showed some impressive findings. 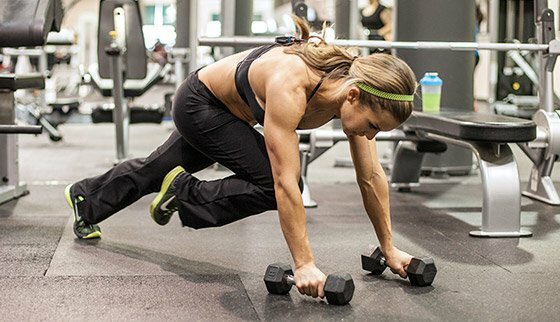 Subjects who completed seven high-intensity interval training workouts over a two-week period increased aerobic capacity by 13 percent, boosted fat-burning capacity by 36 percent, and increased key aerobic enzymes by nearly 25 percent. After the two weeks of interval training, the subjects used less muscle glycogen (stored carbohydrates) during a 30-minute bicycle ride at 60 percent of maximum effort. The high-intensity interval training program they followed consisted of 10 sets of 4-minutes of cycling at 90 percent of max effort alternated with 2 minutes of rest. Long-term studies on this topic confirm that high-intensity cardio training causes more fat loss than typical low-intensity aerobics. Interval training burns more total calories while also increasing the body's ability to use fats as fuel for the rest of the day and night. The body uses more fat for fuel at lower intensities and more carbohydrate for fuel at higher-intensity levels. However, the important factor is the number of calories burned. The interval training burns more total calories while also increasing the body's ability to use fats as fuel for the rest of the day and night. In other words, you get a calorie-burning boost while at rest after interval training. This is something you don't get with lower-intensity aerobics. Even so, most people today still perform endless amounts of low-intensity aerobics and wonder why they aren't making the fat-loss progress they want. I believe this happens for two reasons. One, most people still aren't aware of the incredible fat-burning potential of high-intensity interval training. 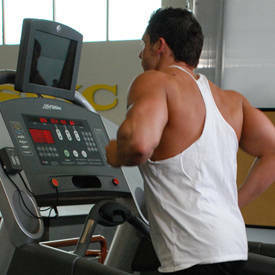 Two, this type of cardio fat-loss training is very hard work. It's much easier to walk on a treadmill or spin a stationary bike for an hour than it is to do 10-15 minutes of interval training. With a typical aerobics fat-burning program you perform your exercise (treadmill, stationary bike, elliptical trainer, etc.) in a steady-state manner at around 60-75 percent of your max heart rate, and your sessions typically last 30-90 minutes (not to mention getting to and from the gym). With interval training, your workout sessions are much shorter and you can add a lot more variety into your program. High-intensity interval training is just what it sounds like: You alternate intense exercise with active rest. But interval training has an even greater advantage during the holiday season. One is obviously the time advantage. Most of us are extremely busy and our time is even more valuable during the holiday season, so shorter workouts are a great way to make sure we are still training. Even better, though, is that we can eliminate trips to the gym. In fact, even if we have a home gym but can't get to it because we're traveling, that's not a problem with interval training. Why? Because we can create endless interval training programs with bodyweight-only exercises, and get in a killer workout session. Personally, I think you can get in a more intense interval session with bodyweight exercises over machines like the treadmill, elliptical machine, or stationary bike. It can be tough to do intervals on some machines because it takes so much time to change the intensity of the workouts as you incline or decline the treadmill or alter the speed you're going at. 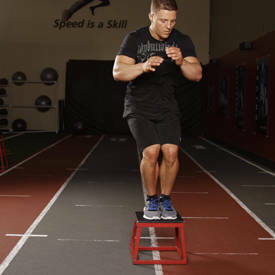 Don't think bodyweight exercises can give you a good interval training workout? 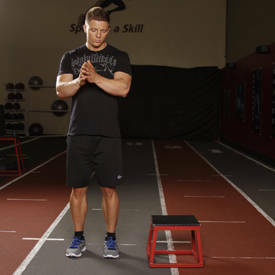 Try using the simple exercise of burpees and perform 8 "sets" of all-out burpees for 30 seconds, followed by 15 seconds of rest. Try using the simple exercise of burpees and perform 8 'sets' of all out burpees for 30 seconds, followed by 15 seconds of rest. Every time you perform an exercise session like this you burn calories and boost your metabolism to burn more calories after the training session is completed. The main reason for this is just as we discussed regarding your high intensity weight training sessions. Due to the high intensity nature of the power cardio routine, you will see an increase in excess post-exercise oxygen consumption (EPOC). What this means is that your metabolism will stay elevated for many hours after you finish the exercise, allowing you to burn more calories just by sitting on the couch. The above study also showed a 14 percent increase in aerobic fitness and a 28 percent increase in anaerobic capacity in only 14 weeks when following a high-intensity workout program. You can include bodyweight exercises in a program for resistance and interval training during the holidays if you can't make it to the gym. Even better, to really give your metabolism a boost, I recommend trying to get in multiple, short-but-intense interval training sessions during the day. Not every day of course, but 2-4 times per week. 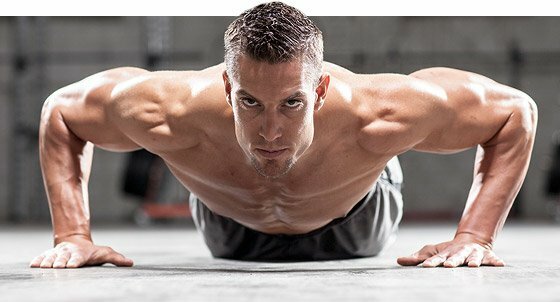 If you need to, you can eliminate the push-up and/or the jump portion of the burpees to make it less intense. With interval training sessions like these, you can quickly get in a workout any time you need to during the holiday season, as well as getting in multiple workouts per day. If you're up to it, rest 2 minutes and repeat one more time. Don't have a jump rope? Replace with jumping jacks, running in place, or just do the jump rope motion without a jump rope! As you can see, these routines allow you to get them in anywhere, anytime, because you don't need any equipment (except possibly the Gym Boss Interval Timer which is awesome!). The holidays are hectic and workouts slide. We just don't have the time to get to the gym, hit the weights, and walk on the treadmill for a total of 1-2 hours a pop. But now you don't have to. You can beat the Christmas bulge with interval training, bodyweight style. Don't just read this article. Try the workouts! R. Bahr, et al., "Effect of Intensity on Exercise and Excess Post-Exercise O2 Consumption," Metabolism 40.8 (1991): 836-841. J. Smith, et al, "The Effects of Intensity of Exercise and Excess Post-Exercise Oxygen Consumption and Energy Expenditure in Moderately Trained Men and Women," European Journal of Applied Physiology 67 (1993): 420-425.